We can only presume they are trying to find the point at which customers push back too much. The nation’s largest banks are testing how much their customers are willing to pay for checking-account services that used to be free. Bank of America Corp. and J.P. Morgan Chase & Co., the two biggest banks as measured by assets, have begun trying new fees in pilot tests from Hayward, Wis., to Newnan, Ga. They include an account that charges a $3 monthly fee for debit cards. Another account designed for electronic-only banking charges customers a $12 monthly fee if customers go to a teller for assistance. In the test programs, some bare-bones checking accounts also now carry base fees ranging from $6 to $9 a month. The new fees, which are limited to accounts for new and prospective customers in the pilot programs, can typically be waived if customers meet certain criteria. The pilot testing is the latest indication of the push to boost fees as banks scramble to make up billions of dollars of revenue expected to be lost from new federal restrictions on debit cards. Chase, which has launched the tests in some of its smaller markets such as northern Wisconsin and Atlanta, is one of the first banks to explore monthly fees on debit cards. Until now, debit cards have usually been a free part of a basic checking account. One new account Chase is testing includes a $3 monthly fee if the customer wants a debit card. It is aimed at less-affluent customers who don’t keep a lot of money in the bank. JPMorgan Chase CEO Jamie Dimon is getting a $12 million bonus, in case anyone was wondering where their overdraft fees from carefully managed overdraft generating deposit ordering is going. Congress is fast working towards approving legislation that will limit fees merchants pay for debit card transactions at 12 cents per transaction. How does Chase plan to get around this? ABC News reports that they are considering a cap on how much can be purchased. While the story doesn’t mention it, I suspect this would be to force people to do multiple transactions where they might previously have done just one, thereby increasing the amount of swipe fees the banks can legally charge the merchants. Perhaps the $1.8 billion JPMorgan Chase paid for Washington Mutual’s assets wasn’t a bargain after all. They’ve tried to deny responsibility for any of the toxic assets that were sold to others by WaMu but the FDIC pushed back hard on that one. Today Allstate filed a $787 million lawsuit against Chase for mortgage-backed securities they bought from WaMu. NEW YORK, Feb 16 (Reuters) – Allstate Corp (ALL.N) sued JPMorgan Chase & Co (JPM.N) on Wednesday to recover losses after the bank allegedly misrepresented the risks on more than $757 million of mortgage securities the insurer bought. The lawsuit against the second-largest U.S. bank was filed just seven weeks after Allstate filed a similar lawsuit against Bank of America Corp (BAC.N), the largest bank, over losses on more than $700 million of mortgage securities. Jennifer Zuccarelli, a JPMorgan spokeswoman, declined to comment on the lawsuit, which was filed Wednesday in the New York State Supreme Court in Manhattan. Allstate, the largest publicly-traded U.S. home and auto insurer, is one of many to sue lenders for allegedly misleading them about mortgage securities. The Northbrook, Illinois-based company said it suffered “significant losses” after JPMorgan and its affiliates misled it into believing it was buying “highly-rated, safe securities” backed by high-quality loans. Information from the latest article in the Wall Street Journal (What J.P. Morgan Knew about Madoff Fraud, 2/17/11) doesn’t look good for JPMorgan Chase. The question over what the banks knew was rekindled Wednesday when Mr. Madoff, in an interview with the New York Times, asserted that banks and hedge funds, which he declined to name, “were complicit” in his fraud. “They had to know,” he said. What if everyone protested what they didn’t think was right? 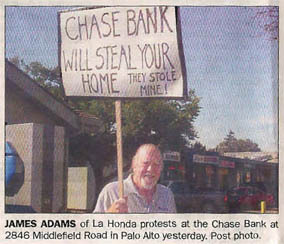 Here is a story from a local paper about a man protesting his foreclosure by Chase Bank. After picketing outside a Palo Alto Chase Bank yesterday, a man has a second chance at getting his home out of foreclosure. James Adams, 63, of La Honda. picketed outside the Chase at 2846 Middlefield Road in Midtown Palo Alto at noon yesterday. He also picketed outside the Chase at 2300 Broadway in Redwood City on Wednesday. Adams told the Post yesterday that he discovered on Dec. 20 that the bank foreclosed on his home of more than 34 years after he worked for months to get a loan modification. “It’s a real common story – there is a corporate culture of greed and lying,” said Adams. Adams said he’d been paying the principal interest on his loan, but fell behind on his payments in 2008 because he developed arthritis in his knees. He added that work had also dried up for his woodworking business at about the same time. Chase called Adams later in the afternoon and gave him a second chance to modify his loan, said Chase spokeswoman Eileen Leveckis. She said it wasn’t because of his protest, adding the bank had been in contact with him since Monday working on the modification. “Do 1 think my protest had an effect on Chase? You bet!” said Adams in an e-mail to the Post. Nevertheless, Leveckis said there’s hope for Adams with the second loan modification. This is yet another example where Chase has proven to be media sensitive to its bad acts. Your single best chance in getting Chase to stop whatever bad behavior it is doing, is to get someone in the press to notice. I wouldn’t be surprised if someone inside the Chase branches where Adams was protesting noticed media presence and contacted their superiors. What if a much larger percentage of people that Chase has abused were to protest like this? I’ll bet it just might actually make abusing customers less profitable for Chase. Hoping to troubleshoot some of the problems plaguing its mortgage operations, Jamie Dimon on Friday dispatched one of his top lieutenants to oversee the Chase Home Lending business. Frank Bisignano, JPMorgan Chase’s chief administrative officer, will now add supervising the Chase’s mortgage origination and loan payment collection businesses to his duties managing many activities, like technology and real estate, for the bank. David Lowman, the current head of Chase Home Lending, will retain his title but now report to Mr. Bisignano. JPMorgan Chase is asking a judge to move the case filed against them by the Madoff fraud trustee into Federal court, where they can demand a jury trial. As this nations second largest bank, and a huge abuser of its customers, I’m not sure they are going to have an easy time finding jurors who don’t think they are a money hungry beast, so, good luck with that Chase.